Every year we celebrate our independence and offer our deepest gratitude to people like Carroll who’ve fought for our freedom. Too often, those who sacrificed so much are now fighting to make ends meet. 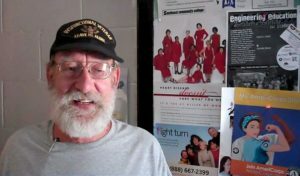 A United States Navy Veteran who spent many years serving our county, Carroll was an electronics technician for as long as he could remember. But since his time in the Navy, Carroll has struggled to find a consistent paycheck. Today, he has a very meager income and comes to the Food Bank for help. Like Carroll, roughly 2,000 local veterans struggle to afford nutritious food. The Food Bank is proud to serve these individuals who have selflessly served to defend our country.